This free event is open to all premium subscribers. The Isle of Four Winds has long been considered one of the mysteries of Elanthia: Where did it come from? Why is it that ships cannot find the isle no matter what sea they sail? What is the secret magic that allows some to travel there and back with ease? While those mysteries remain unsolved, there are other mysteries that have, of late, haunted the population of Mist Harbor. Strange sounds originate from far off in the distance once darkness falls. More than several citizens claim that glowing eyes follow them in the night once they leave the safety of the city streets. Rumor has it that scouts that have gone missing haunt the town's outer limits, while other scenarios place these same scouts in the role of fodder for some foul presence that lives beyond the city. The scouts who do return to Mist Harbor often keep to themselves and avoid public places, as if they have something to hide. Who exactly are the individuals that the Isle of Four Winds government has been inviting to the island for work in past months? Exactly what kind of scouting work are they doing? Why do they frequent the town for a time, then wander beyond the city limits, never to be seen again? And what of the mercurial fortunes of those who return, some driven mad and others possessed of wealth beyond any dream of avarice? These questions have floated among the population of Mist Harbor with increasing interest in answers. Mayor Rishka and other government officials have thus far remained conspicuously quiet in this affair, and anonymous whispers have suggested that not even the government is certain of any real answers. Visitors and Citizens of Mist Harbor! After careful consideration, Mayor Rishka and the Isle of Four Winds government have come to realize that it is time to expand trade and spur the growth of our economy. We have hired workers over the past few months, some of whom have endured great hardship and injury, even death, in order to clear even a small portion of the jungle just outside our city limits. This area has been prepared specifically for the advent of a small festival, sponsored by the government, that will be held from the 6th of Koaratos through the 22nd of the same month. A variety of merchants have been invited from all over the world, and several have agreed to travel here to share their wares and offer their services. Each has been apprised of the risk they take in coming such a distance and setting up outside of aegis of the city. Government officials will, of course, be on hand to ensure that trading goes smoothly during this process, as well as to provide any needed protection. Visitors are highly encouraged to travel to the Isle during this time to attend the festivities. The celebration promises to offer a chance to: look upon the wonder of beautiful Mist Harbor and its environs, explore its shops, interact with new personalities, reacquaint yourself with old friends, and, of course, lounge in the comfortable surroundings that discourage hurry and encourage fully enjoying life and all that it has to offer. It is the hope of this government that this celebration of trade will be a first step in thanking the denizens of Mist Harbor for their support during a new era of growth and exploration for our fledgling town. We hope all will profit from this venture, and that the economy will benefit and grow as a result of these efforts. This announcement has been made with Mayor's Rishka's blessing. In keeping with the announcement, grateful whispers and even joyful shouts at the advent of new trade and economic expansion spread through the Mist Harbor population, and excitement creeps its way into the city. The city hopes to welcome visitors who have the ability to travel to the Isle of the Four Winds to come and join in their celebration. It is worth noting that the rumors and need for answers to the earlier posed questions have nearly disappeared at this point, tapering off ever since the time of the above announcement. Following the bold announcement that Mist Harbor will be taking more active interest in expanding trade and its economy, several government figures have personally seen to publishing further information on what visitors should expect at the Isle of Four Winds Summer Celebration! One coconut, two coconuts, three coconuts, four! Can you find the golden monkey hidden inisde these rapidly changing coconuts? Find him once, play again, find him twice to get a bigger prize, find him thrice? Well, you shall have to wait and see. Think you can create a more delicious platter than your fellow adventurers and shoppers? We challenge you to try! We'll supply the ingredients, then you'll get creative. For those who can't get enough -- just your classic game of darts! A Mist Harbor-wide scavenger hunt. But, of course, there will be a quaint little twist! Writing lyrics takes skill and creativity. Writing them under the pressure of time, partnership, and a limited topic takes flair of a different kind. Think you've got what it takes? Let's see if you do! Don't let the size of the box fool you. Small boxes can contain big prizes, while large ones could be filled with turnips! Will you be the one to swindle the miserly tinker gnome? We shall see! Bring your siegery sets and set out to conquer one another! The mystery of Four Winds Isle remains just that: a mystery. Where do you think it came from? Why can't all persons travel there? What is the magic that surrounds it? What exactly is in the jungle? While there are certainly real answers to these questions, we may not discover them for some time to come. Thus, for the present, theories are all that we have. Tell your story, your theory, but keep it short! Choose your places on the board. Shh, don't tell a soul. Take a turn to roll the die and see if you can outlast your opponents. Can you master the Strategeria? Further details, such as specific times and dates, will be available during the festival. The Isle of Four Winds government and Mayor Rishka hope that all interested parties will be able to attend! 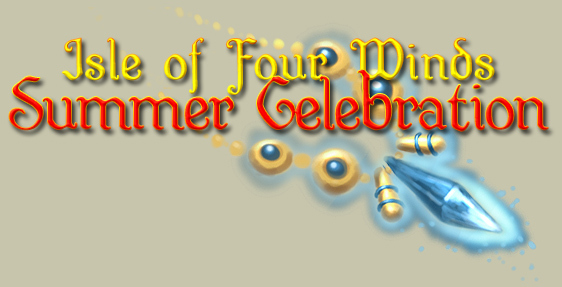 Don't forget to snag your Isle of Four Winds Summer Celebration desktop wallpapers here!